1OECD. (2011). Health at a Glance 2011: OECD Indicators. OECD Publishing. Available at: http://dx.doi.org/10.1787/health_glance-2011-en. Accessed on June 29, 2012. 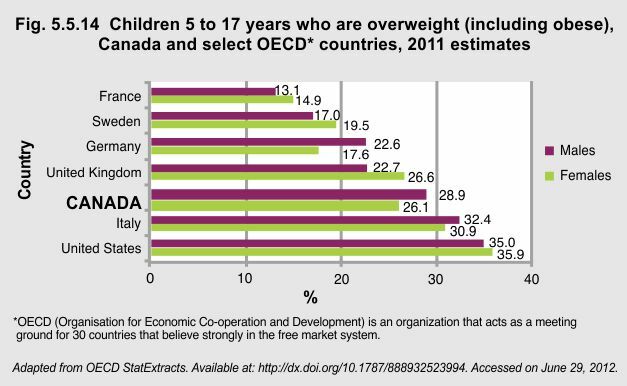 “Research has demonstrated that excess weight puts children at risk for a range of preventable health problems, including type 2 diabetes, cardiovascular disease, joint problems, and mental health issues.”2Increases in sedentary lifestyles, lack of access to healthy food, and decreases in physical activity levels are all contributing factors to the growing obesity epidemic in Canada. 2Active Healthy Kids Canada, 2011. Available at: http://dvqdas9jty7g6.cloudfront.net/reportcard2011/ahkcreportcard20110429final.pdf. Accessed on June 29, 2012.